Twinlab Yohimbe Fuel 8.0 is marketed as an energy supplement and contains eight milligrams of yohimbine alkaloids per serving. Yohimbe has been traditionally used as a performance enhancer, aphrodisiac, energy supplement and general tonic in the tropical West African countries where the Pausinystalia yohimbe tree grows. Yohimbine is an alkaloid that is extracted from the bark, shown to have stimulant properties. Yohimbine HCL is available as a prescription medication for erectile dysfunction, but has largely been replaced by other drugs with fewer side effects. There are a number of yohimbine supplements available over the counter, including TwinLab Yohimbe Fuel. These supplements are commonly taken by men and women as an aphrodisiac or by bodybuilders to support weight loss. According to the manufacturers, Yohimbe Fuel 8.0 “promotes stamina through increased blood flow” and “supports healthy sexual function” as well as supporting the libido. This product contains 400mg of a 2% standardized Yohimbe Bark extract, yielding 8mg of yohimbine per dosage. The supplement also contains calcium phosphate. What Does Yohimbe Fuel Do? Yohimbe Fuel 8.0 is primarily marketed as an energy supplement. According to the manufacturers, this supplement provides a, “fast acting forumla to support healthy sexual function … stamina and energy”. In research studies, yohimbine extract has demonstrated other health benefits, but there is a high frequency of side effects. One of the most widely studied uses for this supplement is erectile dysfunction in men. While yohinbe supplements cannot be marketed for ED symptoms, the yohimbine hydrochloride prescription drug is used for this purpose. A series of 10 randomized trials were performed on men suffering from erectile dysfunction. In all of these studies, one group received a placebo while the other received yohimbine. In the yohimbine group, 30% of participants were able to gain satisfactory erections, compared with 14% of the control group. Yohimbe Fuel is also used for fat loss, particularly during pre-competition “cutting cycles” for male and female bodybuilders. It has been shown to increase the metabolization of fats stored in the body. In one study, a group of soccer players were given yohimbine to measure the alkaloid’s effect on athletic performance. The players took 20 mg of yohimbine per day. While no discernible improvement in athletic performance was seen, those who took yohimbine saw a decrease in body fat. TwinLab’s label includes a serving size of one capsule per day. Each capsule provides 400 mg of standardized Yohimbe Bark Extract, which provides 2% yohimbine alkaloids. This amounts to an effective dosage of 8 mg of yohimbine per day. Since yohimbine is the active ingredient, effective dosages should be determined based on the content of this alkaloid. The manufacturer warns that consumers should not take more than two capsules per day and should not use this product for long periods of time. When taking yohimbine supplements for other purposes, the dosage depends on your body weight and the intended effect. For body fat reduction, the clinically tested dose is 20 mg per day, broken up into two doses. For erectile dysfunction, the dose ranged from one to 100 mg per day in a recent study. The doses were divided and were taken between two and four hours before sexual activity. For anxiety, participants took 10 mg yohimbine at least once a week and then participated in exposure therapy. In another anxiety study, participants took 30 mg 30 minutes before the engaged in therapy. For fat burning, the recommended dose is .2 mg for each kilogram of weight. A man who weighs 200 pounds would take 18 mg.
Before taking yohimbine supplements like Yohimbe Fuel, check with a doctor to determine whether this product is appropriate for you or not. 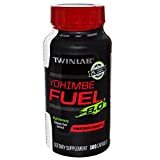 According to user reviews of TwinLab’s Yohimbe Fuel 8.0 supplement, there is a high risk of side effects, especially if taking a dosage higher than that recommended by the manufacturer. However, some users have experienced side effects even at the suggested dose. The manufacturer warns that this product should not be used by children under the age of 18, females or geriatric patients. A range of adverse effects and side effects have been associated with yohimbine supplements when they are taken at higher doses. A survey of reports gathered by Memorial Sloane Kettering indicates that yohimbine supplements can cause anxiety, nausea, high blood pressure, irregular or rapid heart rate, urinary problems, diarrhea, psychiatric problems, sleeplessness and dizziness. Severe priapism. A 42-year-old man reported a prolonged and painful erection after taking yohimbine extract. Surgery was required. Lupus-like symptoms, renal failure and skin eruptions. A 42-year-old-man was admitted to a hospital and received aggressive hydration. His was discharged after two weeks, but readmitted four months later. Acute neurotoxicity. A 39-year-old bodybuilder experienced malaise, loss of consciousness and repeated seizures after taking five grams of yohimbine. Medical examiners have also attributed at least two unrelated deaths to yohimbine toxicity. Yohimbe Fuel 8.0 is not recommended for women who are pregnant or nursing, suffering from depression or anxiety, those with heart disease and those with a high sensitivity to stimulants. It may cause drug interactions if combined with antidepressants, MAO inhibitors and other prescription medications. Consult with a doctor before using to find out if this supplement is safe for you to take. Fifty-six percent of TwinLab Yohimbe Fuel reviews on Amazon are five-star reviews. A number of users have seen positive results for weight loss and sexual performance, but many note the potential for side effects. Many positive reviewers state that users should start with a single dose per day and gradually scale up their use to assess tolerance. Both positive and negative reviewers cited jitters and upset stomach as possible side effects. Some recommend using the product on an empty stomach. A few positive reviewers said that they find the stimulant effect of Yohimbe Fuel 8.0 smoother than the effect of caffeine and that they do not experience a crash as they do with other stimulant products. Those with a negative experience frequently cited that the product did not work for them as desired. Some said that they felt no effect, while others said that the supplement made them feel too jittery or led to side effects like hot flashes. Many mentioned dizziness or nausea that caused them to stop using the product. TwinLab Yohimbe Fuel is available at a number of brick and mortar and online retailers, including Vitamin Shoppe, Supplement Warehouse, Amazon and a number of other fitness and supplement retailers. This energy supplement is typically sold in a bottle of 50 capsules. Analyses of products on the market show that there are significant variations in the quality of yohimbe supplements sold by different vendors. There can be major deviations in the dosage provided, as well as potential contaminants. Always check user reviews before purchasing any dietary supplement and look for manufacturers that manufacture according to cGMP compliant standards. Before you buy TwinLab’s Yohimbe Fuel supplement, consult with a doctor to find out whether this supplement is oaky for you to use and how to best take it to avoid side effects.